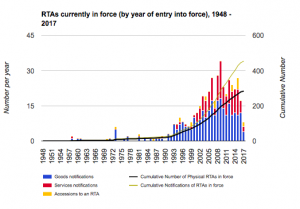 The World Trade Organization recently released a new database on Regional Trade Agreement, which includes an expanded list of topics and provisions that can be searched across all RTAs. There is also an interactive graph and a preferential tariff search tool. (Hat tip: Professor Santana of IELPO). Obviously, not all agreements will be included, given the delays and outright avoidance some countries have when it comes to registering their regional accords. But the data is interesting, including the initial graph outlining the spike in such accords since 1948 (see above).